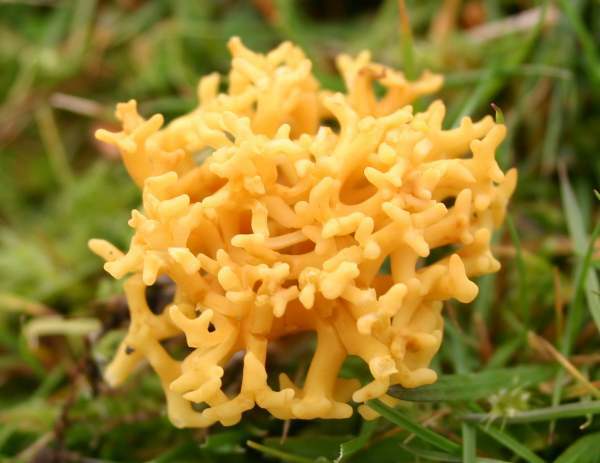 This coral fungus is common in unimproved grassland, including old lawns. 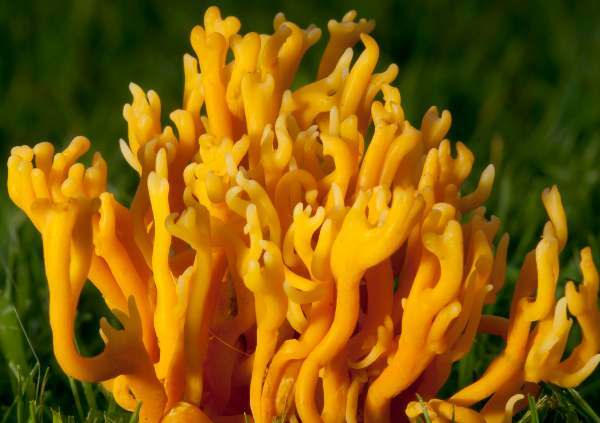 Because it also occurs in woodland clearings, there is a chance of confusion with Yellow Stagshorn, Calocera viscosa; however, the latter is a rubbery fungus that grows on conifer stumps, whereas Meadow Coral is brittle, grows among grass and emerges from the soil. In long grass the fruitbody is often tall and sparsely branching, whereas in close-cropped turf, such as that shown here, it is nearly always much more coral like. In the CHEG scoring system for assessing grassland quality from a mycological point of view, this is one of the clavarioid species that make up the 'C' score. Although reportedly edible (but far from incredible! ), this is such a scarce and diminutive grassland fungus that it is certainly not worth trying to collect it to make a meal. Although locally it may be common, Meadow Coral is an infrequent find in most parts of mainland Britain and Ireland, as indeed it is in many other parts of northern Europe, because unimproved grassland habitats are now so scarce. Clavulinopsis corniculata seems to be much rarer in the warmer countries of southern Europe. This species is also recorded in North America and in many other temperate parts of the world. 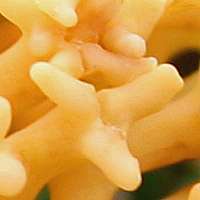 Although Carl Linnaeus had earlier described this species, its first valid name, Clavaria corniculata, dates from 1821, when Swedish mycologist Elias Magnus Fries described this coral fungus in his Systema Mycologicum. It was more than a century later, in 1955, that British mycologist Edred John Henry Corner (1906 - 1996) transferred this species to the genus Clavulinopsis, at which point its currently accepted scientific name Clavulinopsis corniculata was created. Synonyms of Clavulinopsis corniculata include Clavaria fastigiata L., Clavaria corniculata Fr., Ramaria corniculata (Fr.) Gray, Ramaria pratensis Gray, and Clavulinopsis corniculata f. bispora Corner ex Pilát. The specific epithet corniculata also comes from Latin and is a reference to horns, in this case in the form of branching antlers. Branching stems arising from a common thickened base; stems usually branch dichotomously, each branch eventually terminating in two (very occasionally three or more) blunt tips; yellow, maturing ochre or tan-brown; base paler and downy. The individual stems are typically 4 to 8cm tall. Spherical or very nearly so, 4-7µm in diameter; smooth, with a prominent apiculus. Saprobic, on soil in unimproved grassland; very occasionally in deciduous woodland. Clavulinopsis fusiformis is golden yellow and also appears in unimproved grassland, but it branches only very occasionally and then always near its much more pointed tips. 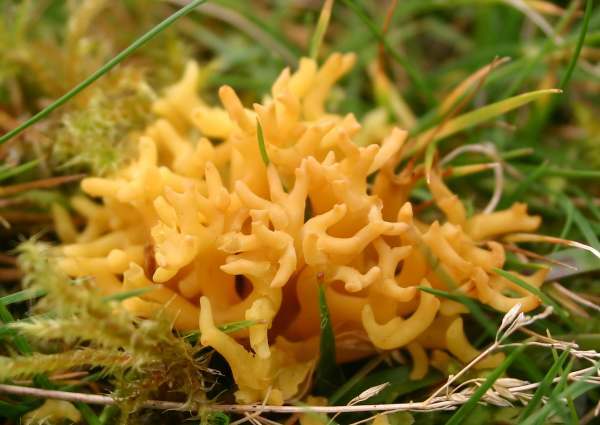 Calocera viscosa, Yellow Stagshorn, is a wood-rotting woodland fungus with viscid, rubbery antler-like fruitbodies.